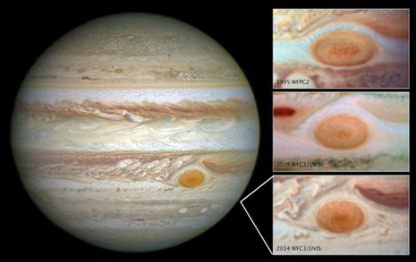 In the middle of the planet Jupiter is centuries been a giant red spot, a huge storm, and that spot is getting smaller. The average is now only 16,500 kilometers, smaller than ever measured before. That’s according to new research from the American space agency NASA, the Hubble Space Telescope to Jupiter has checked out. The cause of the shrinkage is not known. The Great Red Spot is a storm, which can be seen from Earth with telescopes. The wind pulls out speeds of up to 680 kilometers per hour. It is not known how long the storm already raging. In the 17th century, astronomers saw the stain as possible all. A few years ago, swallowed the storm a smaller storm. In the late 19th century, the stain was still about 41,000 miles in diameter. That means that the Earth would fit. Three times in Around 1980, the average was only 23 335 kilometers. The storm turned shrank further in 2009, to almost 18,000 kilometers and is therefore 16,500 miles. Between 1996 and 2006, the spot was a daily kilometer smaller. Now that’s three times as much. If that would constantly go through is the hallmark of Jupiter a few decades away. Scientists do not dare to say whether it really may come so far or not.